Our Self-Cleaning Overband Magnets are renowned around the world as the most effective units for the continuous removal of tramp ferrous material from a product stream. This type of magnetic separator is used to protect, clean and separate materials on applications in the recycling and quarrying industries. Most commonly used on mobile crushing machinery, overbelt magnets are self-cleaning, so that no manual cleaning is required and downtime for the end user is reduced to a minimum. The powerful magnet block enclosed in this system is mounted in a heavy-duty steel frame. The magnet is traversed with a heavy-duty, vulcanized, cleated belt running on two crowned pulleys and driven by either an electric or hydraulic motor, depending on the application. The entire system is designed for durability and is able to operate in the harshest environments. Stainless steel magnet and belt guards on both sides of the magnet are standard and run the full length for safety of workers and protection of the system. We offer two types of magnetic overband separators to work with different types of applications: permanent and electro. 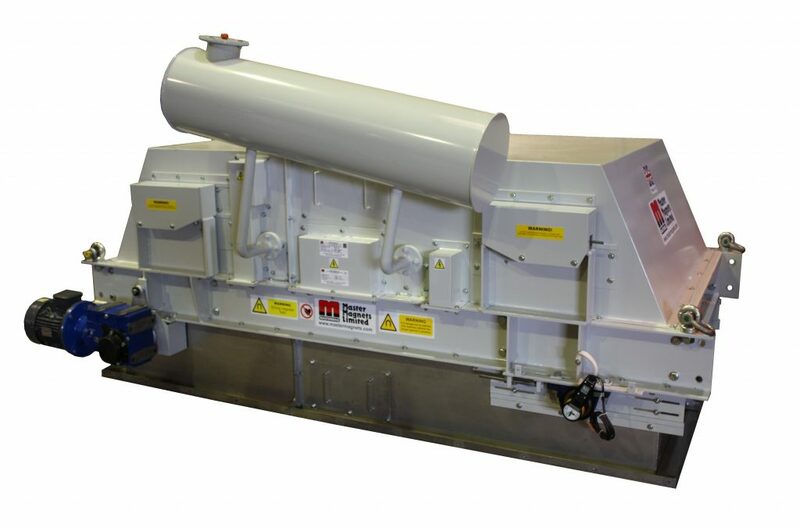 For applications that require a magnet to operate up to 400mm above a conveyor, the Mastermag permanent overband separators are a cost effective solution for a wide range of industries. Master Magnets designed their range of overband separators for use in recycling and quarrying applications. These overband magnets were the first designed specifically for use on mobile crushers. The Master Magnets overband is designed to be a lightweight separator with low running costs as it requires no power source for the magnet to operate. The magnet is also self-cleaning, reducing downtime to a minimum. All models are designed to be virtually maintenance free. Overbands can be positioned either inline over a conveyor head pulley or across a conveyor belt, and are available with either an electric or hydraulic drive. Master Magnets supply Overband Magnets to operate over 150mm – 2000mm conveyor belts. For large conveyor belt widths, Overband Magnets can be custom designed to suit the application. Additional support structures can also be supplied. The Heavy-Duty electro overband is the most powerful overband separator from the Mastermag range. Master Magnets manufacture the widest range of this type of separator, with the largest weighing 35 tonnes and spanning across a 2 metre wide conveyor. Due to its high magnetic strength, the overband is able to work at an increased operating gap, enabling it to extract ferrous from deep troughed conveyors. Electro magnetic overbands are commonly used for installation in plants within the quarrying and recycling industries where they would be positioned either inline over the head pulley or across a conveyor belt. Master Magnets supply Heavy-Duty overband magnets to operate over 150mm – 2000mm conveyor belts. For larger conveyor belt widths, overband magnets can be custom designed to suit the application. Additional support structures can also be supplied. Oil cooled – This type of heavy-duty overband is the most commonly used of the two types. It efficiently maintains an optimum working temperature and is also capable of producing a higher magnetic force than the equivalent air cooled electro overband magnet. Air cooled – This type of magnet is used where oil is not a customers preference for health and safety reasons. For example, a client may wish to use this type of cooling because it is less of a fire hazard. To give the overband magnet a longer belt life (especially when handling abrasive materials) an armoured belt can be fitted as an optional extra. Heat resistant belting can also be supplied to allow the heavy-duty overband to operate at higher ambient temperatures. These magnet systems are normally suspended by their eyebolts, over the conveyor at a specific distance, called the “working gap” – the distance from the magnet face to the bottom of the processed material. Normally suspended from a goal post, A-frame or 4-poster type steel structure, they are available for both crossbelt (perpendicular to the conveyor processing the material) and in-line applications (same direction as the conveyor and over the head pulley). As tramp ferrous metals pass underneath the magnet and become attracted to the face of the magnet, the cleated belt moves the metals clear of the conveyor burden transporting it out of the magnetic field, discharging it away from the conveyor.